Human powered generators can be used in the event of natural disasters, search and rescue missions, blackouts, or any other emergency situation to charge essential electronic devices. 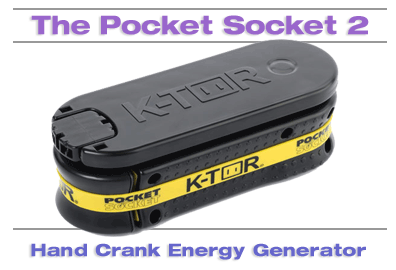 Back packers, boaters, hikers, and outdoor enthusiasts will also find K-TOR® products useful. Made in the USA. 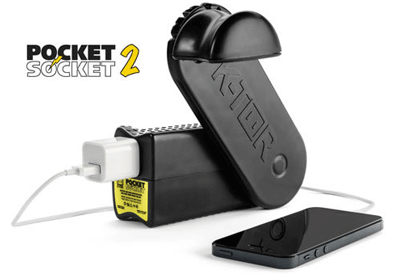 The Pocket Socket 2 is a hand powered generator that charges electronics by hand crank. It generates up to 10watts of electricity at 120 volts. That is enough power to charge a wide range of devices. • Those traveling to areas that don’t have electric power - The Pocket Socket is a great universal travel battery charger for digital cameras, cell phones, flashlights, your GPS, iPhone and more. This is a great vacation device that you can rely on to charge your small electronics. • Camping and hiking so that a back up source of electricity is always readily available - The Pocket Socket generates electricity for flashlights, mobile phones, radios, cameras, rechargeable lights and other devices critical for campers, hikers and those in the great outdoors away from an AC outlet. • Emergency personnel and those in a natural disaster, such as an earthquake, hurricane or tornado - The Pocket Socket can make a difference between life and death in natural disasters that interrupt electricity. You can generate electricity by hand power when electrical sources are unavailable. • Emergency supply and survival kits for a home emergency, car emergency and general emergency preparedness - The Pocket Socket should be included in every 72 hour and emergency survival kit. It can be the difference between life and death in an auto, weather or natural disaster. • An alternative to solar powered chargers that rely on the sun to generate electricity - Solar powered generators don’t work at night or in the shade. Our hand crank generator, The Pocket Socket, works all the time, at night and in bad weather when the sun is not available. K-TOR® Quality - K-TOR® products are manufactured with high quality, durable materials. They are designed to operate efficiently and last for years. Service & Support - K-TOR® is committed to providing excellent customer service in a timely manner. Service and support, like our manufacturing is based in the U.S. Responses to customer inquiries are made quickly and, often, by the founder Ken Torino himself.